Did you enjoy the hilarious film HOME from Dreamworks last year? It was one of our favorite animated films from 2015. 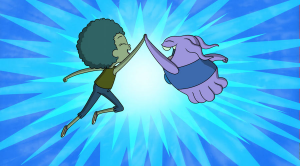 Luckily, we can continue the adventures of Tip and her alien pal Oh on Netflix. When Oh moves in with Tip, mom Lucy and cat Pig, he discovers that he’s truly found his “home” – and everyone in your home is sure to love this all-new coming-of-age buddy comedy. The multi-talented voice cast is led by Rachel Crow (The X Factor) as Tip and Mark Whitten (Rolling High) as the voice of Oh, along with Ana Ortiz (Devious Maids) as Lucy aka My Mom, Ron Funches (Get Hard, Undateable) as social media maven Sharzod and Matt Jones (Breaking Bad, Mom) reprises his film role as best friend Kyle. Check out trailer for the new season below!